With fellow nutcase ocean rower Katie Spotz we had conceived a 100+ mile triathlon between Oxford and London – borne out of a very generous wetsuit sponsorship from the guys at Blueseventy, and a couple of speaking events I had planned in Oxford. 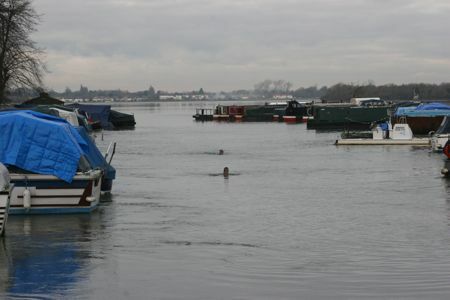 The idea of a swim quickly grew into a triathlon down the Thames. Dan doesn't believe in wetsuits! Accompanied by ‘Big Dan’ Martin we started with a quick dip in the flooded Isis, swimming down part of Port Meadow, squealing with the cold that quickly numbed our fingers into searing pain and amusing some locals looking out from their houseboat as we bobbed past. The pixie ice round the water’s edge was especially pretty if not a little uninviting. Following a not-very-quick-with-chilled-fingers-change in the carpark (in which Katie gave a whole new meaning to the term ‘Pay and Display’) we hopped on the bikes and headed out through town and east to London. Our route took us through different counties, along flooded towpaths and through watery villages, along quiet roads cutting through baldly brown fields in their winter coats under a gentle sun and on into the London ‘burbs in the dark. All the while we criss crossed with Dan and my brother Matt in their support vehicle role. It felt so good to be out, whizzing along, doing something different and sharing crazy ideas and musings with Katie. Arriving in Teddington with just 68 miles on the clock, we knew we had a long ‘on foot’ section ahead to get the century, so we tucked up in the pub for an hour and fed happily, packing in the calories and warmth. It was already frosty when we left at 10pm, misty and quiet, the almost-full moon a silvery disc of brightness in the orange city glow of night. Temp dropping. Stars risen. Pedals turning. Criss crossing through floods. On to Richmond where we leave bikes for feet and run to town. It was gorgeous to be trotting alongside the river, crunching in frosty mud, stepping round muddy puddles with a painted moon floating in them. The river flowed madly towards the sea, sometimes on our left, at other times on our right, as we crossed over it in search of paths. Early on we met lots of geese chattering and saw ducks floating sleepily, as we ambled and jogged through woods and parkland, alongside buildings and shops and into the heart of the city. My back and hips had announced rather painfully quite early on that they weren’t too happy about me running much of the way, so we mostly power-walked, jogging from time to time. Later a little troupe of blisters set up camp on my feet and joined in the ‘no running’ protest too. Through the wee hours as the temperature dropped and the mist grew closer, we too grew chillier and Katie struggled to keep warm at our pace. Turning around at Westminster after 20 miles on foot, ready for the final leg back to Kingston was not quite the climax we had orginially anticipated – there was still a good way to go. Half an hour later I spotted a Boris bike station and promised my toes a little rest. While I was clocking out a bike, Katie started jogging – she was happy to run and keen to be warm. This was a happy happy moment all round – back on the bike I could fly and it really didn’t look like Katie had been on the go for all those hours – she was pacing it. Thanks to Blueseventy for the wetsuits, Natural Balance Foods for the delicious food, Rutland Cycling for my bike, to Dan and Matt for supporting us, and Catherine and John and Sally and Clint for having us to stay. Sarah you must have a thing about punishing yourself. A 21 hour adventure and still smiling at the end – fantastic! regards Eddie. Amazing. I love a spontaneous outing, when everything gets a bit boring. I also love the fact, that its two women, who, instead of sitting at home, making Christmas preparations, on a whim decides to have a bit of fun with a 100+ mile triathlon. I love it. Exhausted me just reading it – but then you thats not unusual when i read your busy challenges Sarah.